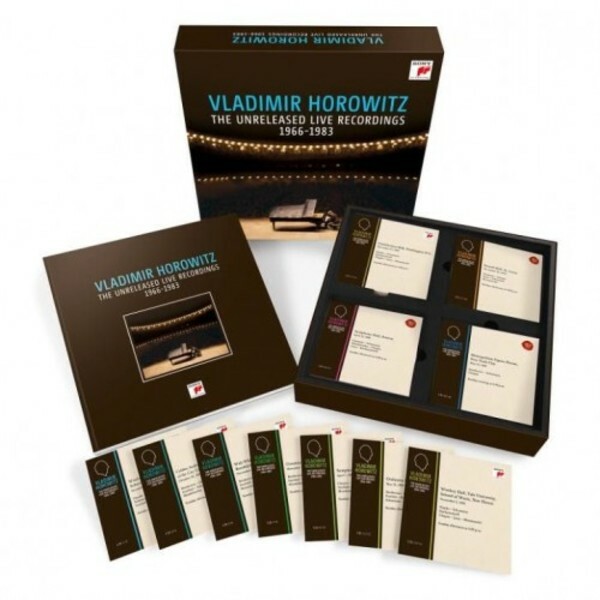 After the overwhelming success of 'Vladimir Horowitz live at Carnegie Hall', Sony Classical presents 'Vladimir Horowitz: The Unreleased Live Recordings 1966�1983'. This edition takes you on tour with the legendary pianist from his home town of New York to the great halls of the USA, from New Haven to Chicago, Washington DC, Philadelphia, Boston and beyond. This special collector�s set features 13 programs recorded at 25 solo recitals in 14 different concert halls. It comprises the complete live recordings made by Columbia Masterworks between 1966 and 1968, as well as the live recordings made by RCA Red Seal between 1975 and 1983. While a few extracts from these live recordings were selected for release as award-winning albums, the vast majority rested untouched in secure storage and have remained unreleased for more than 30 years � until today. This new edition presents Vladimir Horowitz�s musical artistry, live and unedited in state-of-the art 24bit / 96 KHz mastering, at the price of a concert ticket.